This is a fantastic resource! It is full of meticulous information regarding the recent development of chemicals and toxins in things we encounter on a daily basis. For me it was eye opening to say the least. 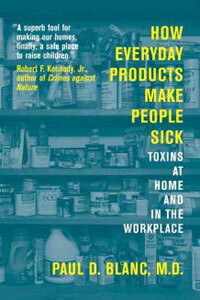 I had no idea that so many people have died as a result of chemicals in their workplace for example! It was extremely thorough and factual looking at the progression and its effects on humanity. Some indoor paints have an additive in them to prevent mildew and that additive is high in mercury poisoning the whole family but particularly babies/children. Avoid benzene and hexane. Benzene attacks the blood system. Hexane attacks the neuro system as well as other parts of the body. Both are found in lots of stuff still today. The Nike co-founder Bill Boweman poisoned himself with hexane-laced glue making the shoes! In artificial nail glue is acetonitrile - the body converts this to cyanide! Chloramine exposure is endemic in heavily chlorinated swimming pools. Nitrogen containing human body sweat and urine in pools combine with chlorine to make chloramines. Chloramine exposure is associated with risk of childhood asthma. High levels of Carbon Disulfide makes people go insane. It is a solvent and also in widely used insecticides eg metam sodium. It is also in cellophane, bamboo manufacturing and viscose rayon. Dinitophenol used for weigh loss blocks one of the bodys main metabolic pathways, driving up energy consumption. It induces blinding cataracts! Avoid wood preservatives. The only safe ones eg Burnettizing have been discontinued and ones such as creosote (known to cause cancer) and Kyanization (contains toxic mercury) and Metam Sodium (as mentioned above in high levels causes insanity and other things) are widely used and growing. There is so much in this book that I'd probably learn new things every time I read it. I really recommend it if you're interested in an indepth look at the origins of all this through to today.